Drama, Iran, 2011, 123 min. Tagline Lies may lead to truth. 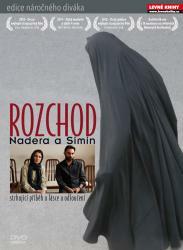 Synopsis Nader ('Peyman Moaadi' )and Simin (Leila Hatami) argue about living abroad. Simin prefers to live abroad to provide better opportunities for their only daughter, Termeh. However, Nader refuses to go because he thinks he must stay in Iran and take care of his father (Ali-Asghar Shahbazi), who suffers from Alzheimers. However, Simin is determined to get a divorce and leave the country with her daughter.